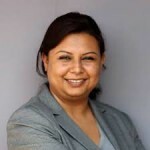 Arpita Nepal is the Co-founder and Director of Research and Development at Samriddhi, The Prosperity Foundation. She also oversees curriculum design of the Foundation’s education and training programs along with strategizing advocacy campaigns. Some of Samriddhi’s flagship programs such as Arthalaya – School of Economics and Entrepreneurship and Nepal Economic Growth Agenda were conceived and executed under her leadership. She has remained a part-time faculty member of two colleges in Nepal for over five years and has been involved in activism for democracy. She holds double Master degree in Economics from George Mason University (USA) and Tribhuvan University (Nepal).